Philadelphia coupon is a mailed and printed coupon available on Websaver.ca’s website. You can either choose to print or have websaver mail the coupons to you for free. I usually choose to have it mailed in case the coupon doesn’t print properly. You only get one chance. 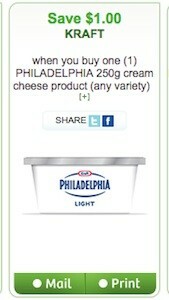 This is a Kraft coupon to save $1 when you buy one Philadelphia 250g cream cheese product, any variety. Kraft coupon is valid only in Canada. 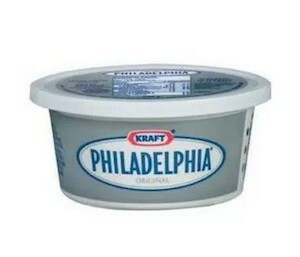 You can find Kraft Philadelphia cream cheese in any major supermarket. Philadephia Cream Cheese Spread is perfect for spreading on bagels and crackers, but also great in cooking – from pasta sauces to appetizers to desserts. Rich and creamy taste Perfectly spreadable texture Get inspired at cookingwithphilly.ca. You can find cream cheese at Walmart for $4.47.